Hawk Meaning – What Does This Spirit Animal Signify? The regal hawk totem acts as a fierce leader in nature. Its massive three-plus foot wingspan, tall and domineering stature, piercing eyes can spot a mouse from hundreds of feet. Its menacing talons make it an extremely impressive, albeit scary, avian and creature in general. Appropriately, the body of the hawk animal totem is symbolic of power, strength, agility, energy, and protection. 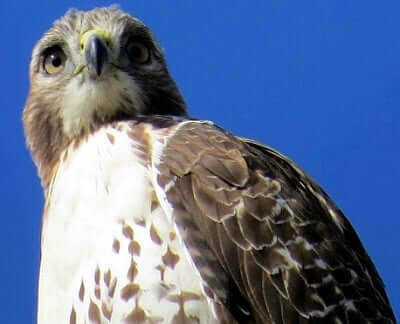 In addition to their stern and powerful physique, the hawk is also in possession of a very sharp mind, symbolizing intensity, strategy, intelligence, and concentration. With such strong qualities, it should come as no shock that the hawk has several spiritual symbols to offer us. Throughout history, the hawk animal spirit became involved in a partnership with humans in the same way that Falcons did. This relationship assisted humans in survival and defense. Hawks were also trained to hunt and return their prey to their handlers. This practice was particularly relevant for desert dwellers. As a result, this process of training these fierce beasts led to the development of a close and loyal bond between trainer and trainee. Besides, the relationship reflects the mutual respect that is crucial for balance between all players in nature. Because of their value, ancient cultural beliefs recognized the hawk totem with how a person’s soul moves into the afterlife. In ancient Egypt, Charon, the god responsible for guiding souls across the Styx River, had a hawk head. A hawk was released after the death of prominent people to symbolize his/her soul is moving into the afterlife. Similarly, in the Roman empire, with the souls of great emperors was evident as hawks flying to the heavens. In Norse mythology, Valkyries transformed into hawks to transport the souls of soldiers lost on the battlefield. Across the globe, several Native American groups believed the hawk symbol to be a link with their ancestors, who would give tips to warriors in battle. More simply, the Aztecs lived by the conviction that hawks were the direct messengers of the gods. A hawk animal totem soars into your life to make you aware of messages to that manifest in your life. They are highly intelligent creatures and serve to make you more in tune with your awareness and consciousness. Hawk totem frequently symbolize seeing the deeper meaning in ordinary experiences. You, too, can also figure them out if you practice being more observant. By calling upon this bird, you enable yourself to free yourself from limiting thoughts, beliefs, and behaviors. Furthermore, it will allow you to fly higher and gain a greater perspective. By looking at the bigger picture, you will be able to do more than survive: you will flourish. Enlightenment is of the utmost value, and the hawk holds the key. Stay focused, and you will soon receive the knowledge or information that you seek. Is the hawk your animal totem? If so, optimism must be one of your strongest virtues. You must revel in sharing your visions of a brighter future for yourself, others, and the world. Because of this ability, your vision may be more advanced than others. As a result, may often be difficult for you to relate to others on a deep and philosophical level, as they can not understand your musings. As such, the hawk symbolic meanings suggest that you should learn to add some subtlety to your messages. In turn, this can make them more relatable on a basic level. If you are too forceful, others will retreat, causing you to feel isolated. There is no need to be arrogant and flashy with your gifts. Use them with grace. To dream of the hawk can mean different things. Sometimes, the bird may grace your dreams. The hawk symbolism can denote suspicions that are lurking around your life and the activities that you participate. Proceed with caution, using your grand vision to predict follies before you commit them. In nature, the hawk animal totem is known to have a very keen sense of sight – one of the sharpest in all of the animal kingdom. For us, this symbolizes using insight. Keep a close eye on someone or a situation in your life. Not everyone has the best intentions, and you must have the vision to weed out the good from the bad. Next Panther Totem – How Courageous Are You?